Keyboard shortcuts can be one of the quickest ways for proficient users to navigate around a program. Lightroom is no exception, as can be evidenced by the plethora of keyboard shortcuts available and the fact the team dedicated a shortcut (Ctrl or Cmd + /) to displaying the shortcuts relevant for the current module. 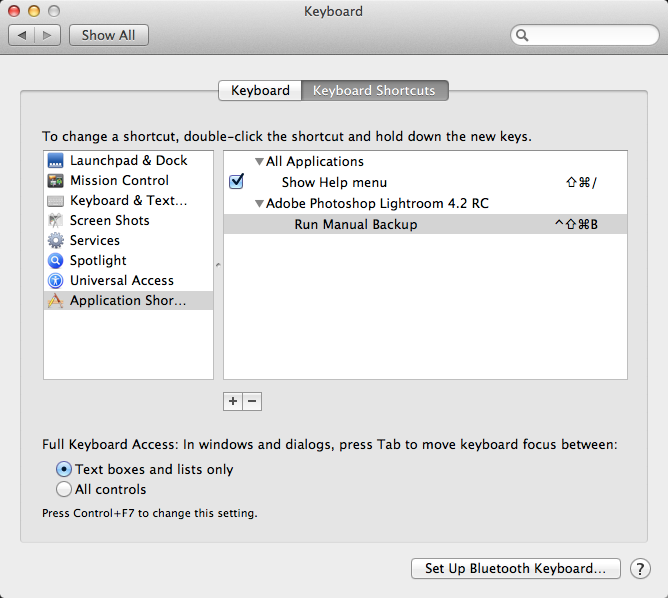 Back when Lightroom 2 was the latest and greatest version available I wrote about how to configure it to use keyboard shortcuts to access plugin menu items. At the time the Lightroom SDK provided many capabilities but assigning keyboard shortcuts to menu items was not one of them. In Lightroom 3 the method I used was “baked into” Lightroom so the configuration steps I outlined were no longer required. Today we’ll be discussing how to take advantage of these capabilities including the slight change introduced by Lightroom 4. The first thing to note about the Lightroom SDK’s keyboard shortcut capability is it is specific to the Windows platform. Mac users needn’t feel left out as you can use an existing capability of OS/X to more than make up for this limitation. Above is a screenshot of the Plug-in Extras menu from within the Lightroom’s File menu. If you look closely at the screenshot above you will notice an underlined character in each menu item. Specifically the u character in Plug-in Extras, and the B character in Run Manual Backup. These are known as accelerators and are a standard Windows feature to allow the use of your keyboard to navigate menus. Please note that accelerator hints (the underlining) only appear if you have used the keyboard shortcut (in this case, Alt + F) to open the main menu first. This might seem convoluted but your average keyboard shortcut junkie can fire off key presses fairly quickly. Much quicker than they could use a mouse to navigate through these multiple levels of menu items If the menu item is something you need to call pretty regularly (say a Photomatix HDR menu item) this time saving can start to add up. The difference here is the change in accelerator key at step 2, from s in Lightroom 3 to u in Lightroom 4. Unfortunately the u accelerator character was already used in Lightroom’s File menu by Clear Quick Collection so users must press the u accelerator key to select the correct menu item then use the enter key to open the sub-menu or, in other cases, choose the menu item. The same goes for any case where an accelerator key is shared across multiple menu items so please keep this in mind. 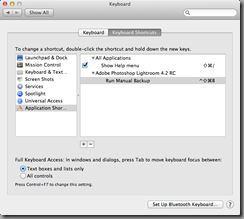 To use keyboard accelerators to access Lightroom plugin menu items the plugin author must have embedded them during the development process. It’s easy to do, is described in the Lightroom SDK documentation and the approach is essentially unchanged from that outlined in my previous post. The prolific Jeffrey Friedl, author of many well known Lightroom publish services and other plugins, and myself both use this technique but I’m unsure how wide spread the practice is with other plugin developers. The technique outlined above doesn’t work on Mac OS/X. Thankfully Macs already include a powerful facility to create keyboard shortcuts for any application menu item so its easy to work around this limitation. To add a shortcut directly to a menu item. Open the Apple –> System Preferences menu item. Open the Keyboard item in the Hardware row. Click Keyboard Shortcuts if the tab isn’t already selected. Click the "+" button to add a new keyboard shortcut. Choose which application the shortcut will apply to (Lightroom) then enter the exact name of the menu item. Important: Make sure you prefix the menu item with the three spaces Lightroom uses to indent the plugin menu item in Lightroom 3 and 4. e.g. 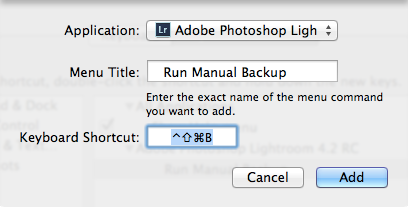 “Run Manual Backup” needs to be entered as “ Run Manual Backup” for the shortcut to work as expected. Click in the Keyboard Shortcut field and press the keyboard shortcut you want to associate with this menu item. Click Add and you now have direct keyboard access to the menu item! The instructions and included screenshots are for a system running Lion (OS X 10.7.x). Instructions for older versions of the operation system are essentially the same with the name of the item selected in step 2) being the only known variation. For keyboard acceleration to work on Windows, plugin developers must make a small but crucial change to their code during the plugin development cycle. If the developer of your favourite plugin hasn’t enabled this feature, please provide feedback to them. Its a trivial change and most of the developers I know are quite responsive so it doesn’t hurt to ask! Your tip to make sure you enter three spaces for plugin items just saved the last few strands of hair on my head from being pulled out. @Richard, glad we could help! It certainly is an odd requirement so I’m sure it has stumped more than a few people. @Vitally, glad it helped you. I think I read about it in one of the forums. And the other article has been updated now. Thanks for the suggestion.